Tijuana Police Chief Battles Corruption, Cartels In his two years as chief, Julian Leyzaola has purged his force of corrupt cops and returned a sense of safety to the city. But human rights groups say he has gone too far in his battle against some of the most powerful criminal syndicates in the world. In Mexico, Tijuana's police chief is known as an enforcer: In his two years as chief, Lt. Col. Julian Leyzaola has purged his force of corrupt cops and returned a sense of safety to the city. But human rights groups say he has gone too far -- even using torture -- in his battle against some of the most powerful criminal syndicates in the world. Leyzaola is a fit 50-year-old with sinewy forearms and a furrowed brow over an intense gaze. He came up through the ranks of the Mexican military and demands military-style loyalty and discipline from his troops. 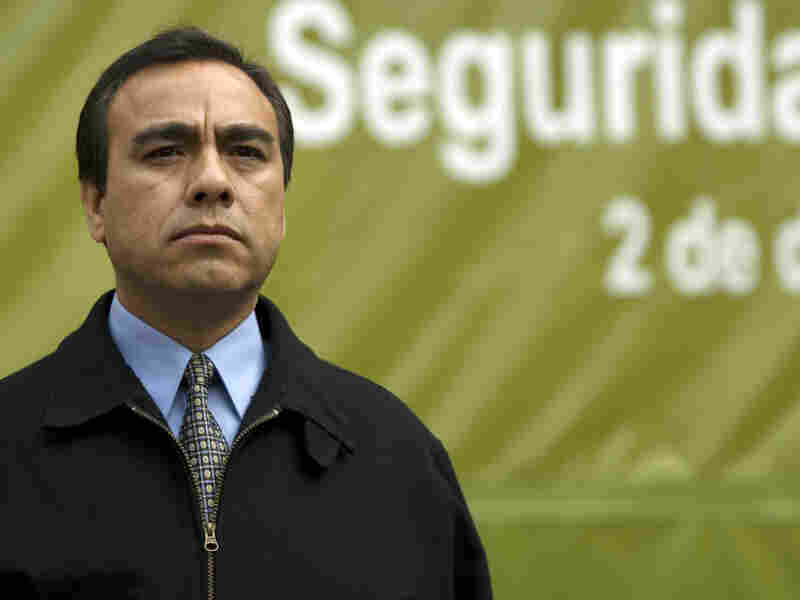 Since taking over the Tijuana police department in December 2008, he has fired more than 600 officers, or roughly 20 percent of the force, whom he says were corrupt. "A police officer can't work if he's suspicious of his partner who's at his side," Leyzaola says. "He's never going to be able to do his job of arresting important criminals because he worries his partner might betray him." For decades, paying off local cops has been standard operating procedure for the cartels. The border city of Tijuana is no exception. But last month, when Leyzaola's men seized 134 tons of marijuana in a single bust, authorities say it showed that Tijuana cops have changed. Leyzaola says corrupt cops were undermining public security in his city. "A criminal is a criminal, and if he's wearing a uniform that's even worse," Leyzaola says. So we went after them. When Leyzaola took over the Tijuana police department, the city was in the midst of one its worst crime waves ever. Homicides were at an all-time high. The cartels were beheading their rivals, gunning down policemen and stringing up corpses from highway overpasses. One cartel employee known as El Pozolero, or the Stew Maker, confessed to dissolving some 300 bodies in vats of acid. Thousands of Tijuana residents who could afford to moved their families to San Diego. People were afraid to go out not just for dinner but even for lunch. We must make them feel like criminals. We need to push them down to the criminal level. Now a criminal can't sit calmly in the movie theater. He can't go to a meeting at his kid's school or to his daughter's quinceanera, because he knows that anyone can denounce him. Leyzaola says his plan was to make the narcos' lives hell. "We must make them feel like criminals. We need to push them down to the criminal level," Leyzaola says. "Now a criminal can't sit calmly in the movie theater. He can't go to a meeting at his kid's school or to his daughter's quinceanera, because he knows that anyone can denounce him." Leyzaola says organized crime has become a threat to the Mexican state and needs to be beaten back. But in his zeal to root out corruption and cleanse the ranks of the Tijuana police, human rights groups say Leyzaola personally oversaw interrogations in which suspects were severely beaten, shocked and suffocated. Leyzaola denies this. He says these criminals aren't babies who can be handled, in his words, "with feathers." Heriberto Garcia Garcia, the head of the state human rights commission, issued a report in August documenting accusations of former police officers who say they were tortured by Leyzaola. "We can't say, 'Because I'm trying to restore public security to the country, this permits me to violate human rights,' " Garcia says. He says the officers were forced to confess that they were working for the drug cartels. The number of drug-related killings continues in Tijuana at nearly twice the rate of 2007, but many residents say the city feels safer now. "The perception is that the city is more secure," says Mario Escabedo, president of local Chamber of Commerce. He says the improvement in security in Tijuana right now is due to the changes hammered into place by Leyzaola. "Julian Leyzaola has dignified the police department," he says. "It used to be that if your son was a policeman, you'd say he's something else." Escabedo says people are now returning to the restaurants and other public places. Although tourists still haven't come back, nightlife catering to locals has rebounded. Officer Alberto Salazar from the Central Station is cruising slowly up Coahuila Street, the heart of Tijuana's red-light district. Prostitutes in miniskirts and high heels lean against the facades of bars, nightclubs and low-rent hotels. Salazar's patrol car rolls past the Hong Kong Gentlemen's Club, the Scandal disco, mariachis waiting for work. He blasts his siren at a guy who has fallen asleep in his double-parked car. He makes the driver move and then drives on. Things are slow, Salazar says, and this is good. He estimates overall crime in this sector of the city has dropped 80 percent this year. He says Leyzaola has put more patrols on the street, and the police no longer have to drive around in convoys as they did last year out of fear of getting shot. Salazar says these days he is dealing with car thefts, break-ins and holdups at convenience stores -- routine criminal activity. And he's happy about that.